Each year, the Middle Georgia Regional Commission holds an annual meeting to promote and disclose the business operations of the past year to its governing council, the business community, and the public at-large. The event is catered and typically averages 250 in attendance. This year’s meeting was held on Thursday, October 11, at the Anderson Conference Center with a reception beginning at 5:00 p.m. and dinner at 6:00 p.m. The MGRC does not use appropriated funds to host its Annual Meeting. In order to cover expenses, the MGRC seeks sponsorships from existing business partners and related organizations. If you are interested in sponsoring future Annual Meetings for the MGRC please contact us at (478) 751-6160. Additionally, you can find more information about sponsorship levels by clicking here. 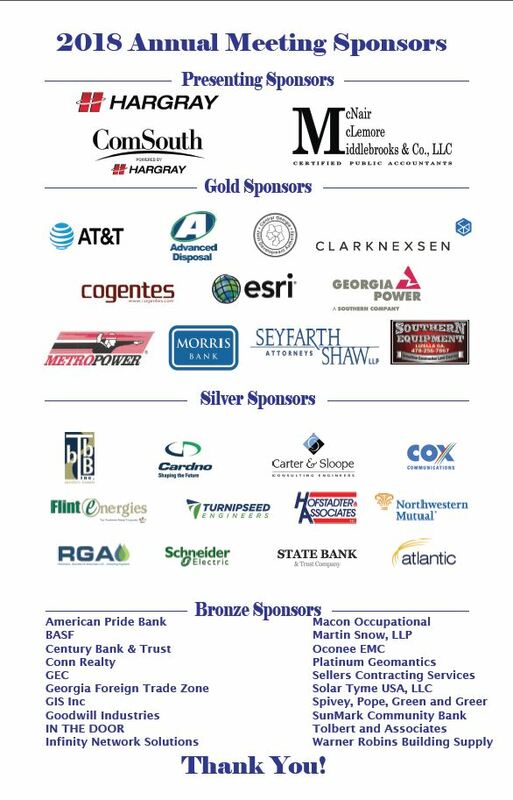 The following sponsors contributed to the success of the 2018 Annual Meeting.